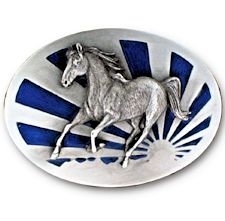 This gorgeously crafted 100% lead free pewter oval horse belt buckle proudly sports a stunning three-dimensional depiction of a running horse set against a background rising sun done in hand crafted blue enamel. 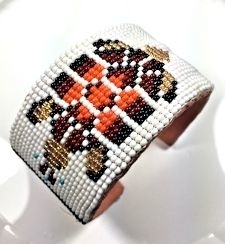 On the back is an inscription that reads, "This buckle is a tribute to the horse. The horse is a powerful and beautiful animal that has served mankind for hundreds of years. Few sites are as awe inspiring as a running horse." This belt buckle is approximately 3 3/8" long and 2 3/4" tall at the widest part. It fits up to a 1 3/4" belt. This product was added to our catalog on 04/20/2018.